You can hear the smooth, velvety sound of the clarinet in orchestras, military bands, and jazz groups. Clarinets are made of wood or molded plastic, and can be found in different sizes, each playing a different range of notes. The standard "B-flat" clarinet is a little more than two feet long. An orchestra also often includes an "E-flat" clarinet, which is smaller and plays a higher range of notes, and a bass clarinet, which plays an octave lower. To play the clarinet, we blow into a single reed that is clipped to the mouthpiece at the upper end of the instrument. The reed is made out of cane. We can play different pitches by pressing on the clarinet's many keys. The bottom of the clarinet flares out into a bell shape. The clarinet was invented in the early 18th century by Johann Cristoph Denner, a German flute maker, as a modification of a folk reedipe, the chalumeau. By the 1840s two complex systems of keywork had been developed for the instrument. Clarinets became common in orchestras by about the 1780s. Early works featuring the clarinet include an overture written by George Frideric Handel for two clarinets and a horn and the clarinet concerto by Wolfgang Amadeus Mozart. Clarinets have a smooth, mellow tone. With a very large range of four octaves, from warm low notes to a pure and clear upper register, the clarinet is often featured in orchestral solos. It can play a long, beautiful, velvet melody, and then burst into a ripple of fast scales. Here's a picture of the clarinet, so you can see all its parts. The clarinet mouthpiece fits into the top of the instrument and holds the reed. It is usually made of wood or plastic. The clarinet has a complex keywork system. The keys cover holes in the body of the clarinet, and make it possible to control pitches. 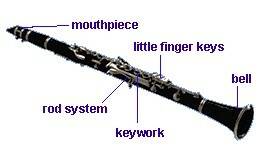 The little finger keys are very important on woodwind instruments. Pressing down one of these keys opens or closes a pad further down the instrument, beyond reach of the hands. The thumb rest is a small metal plate, attached to the back of the clarinet, that helps the clarinetist support the weight of the instrument with the right thumb. One technique clarinetists often use is called "bending" notes. This means varying the air pressure on the reed and partly covering tone holes to change pitch. This is especially useful in jazz solos! In fact, clarinets are as common in jazz bands as in orchestras.